Donnington Castle was built by its original owner, Richard Abberbury the Elder, under a licence granted by Richard II in 1386. Richard de Abberbury was a knight in the Black Prince’s household, and a guardian of the Prince's son destined to become Richard II. This position of trustlater helped secure the licence. Richard de Abberbury was a renowned knight who fought at Poitiers during the Hundred Years War. The surviving castle gatehouse dates from this time. It is thought to be the work of the architect William de Wynford, who was known to be working in the area for William of Wykeham. Donnington shares its origin with the more famous Bodiam Castle in East Sussex which was also built by a knight surviving the Hundred Years War. The castle was subsequently bought in 1415 by Thomas Chaucer, the son of the poet Geoffrey Chaucer. At his death the property was given his daughter Alice, who later became Duchess of Suffolk. This family later fell out with the monarchy because of the poliitical activity of the Duke who was imprisoned for a while in The Tower of London. The family survived these events only to have the castle confiscated by the Crown in 1503 because they were on the losing side in the War of the Roses. King Henry VIII vistied the castle. 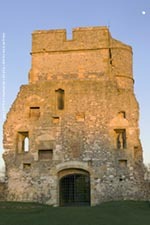 Subsequently Queen Elizabeth I visited Donnington Castle and had previously wished to live there during her imprisonment by herhalf-sister, Queen Mary I, which was not allowed. Charles Howard, Earl of Nottingham, was given the castle by Elizabeth around 1600. The Earl was overall commander of the fleet which defeated the Spanish Armada. (Left) The only significant structure remaining on the site. This is the gatehouse. 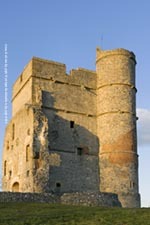 Donnington Castle is an English Heritage managed property. created by cannon shot during the civil war. By the time the English Civil War broke out, the castle was owned by the Parliamentarian Packer family. It was siezed and held for the Crown by Sir John Boys after the First Battle of Newbury. It was then beseiged by Packers Parliamentary allies and at the end of the war was uninhabitable because of artillery action. Despite being besieged for18 months the castle succeeded in guarding the major routeways from London to the West Country and Oxford to Southampton. During the Second Battle of Newbury, the castle held off the Parliamentary attackers due partly to the additional defences installed by Boys. Finally the garrison surrendered and were allowed to rejoin Royalist forces in Wallingford. In 1646 Parliament voted to demolish the castle. All that remains of the castle today is the substantial towered gatehouse shown here, and the surrounding earthworks.